Constable Kristy Eyles has been riding motorbikes on the farm since she was a child, so it came as no surprise to those around her when she became Tasmania Police’s first female motorcycle police officer in 2012. Southern Road and Public Order Services. Riding a police motorcycle is no easy feat. The motorcycle currently used by Tasmania Police (a BMW R1200RT-P) weighs close to 300kg when fully laden with fuel and all the required gear. “It’s a big bike; I’m constantly amazed when people don’t see me because it’s only slightly smaller than a small car. I had my motorbike license for five years before I applied, so that experience on the road definitely helped when it came to completing the Tasmania Police motorcycle course,” she said. 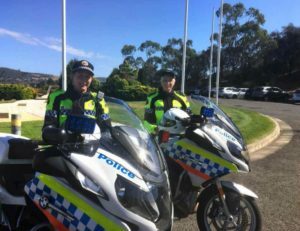 The motorcycles are an important asset to Tasmania Police, assisting with supporting road safety strategies, manoeuvring in traffic congestion, public event management, dignitary escorts and ceremonial duties. “Representing Tasmania Police with Sergeants Hodgkinson and Jones in the Wall to Wall Ride for Remembrance in 2017 was an absolute honour. I was the only female police rider present; I hope in years to come there will be more,” she said. Inspired by Kristy, Constable Despina (Desi) Amerikanos joined the motorcycle squad in 2017 – first in the Western District and currently in the South. “I feel proud to be the second female police officer to achieve such a feat in Tasmania Police. Kristy’s achievement gave me the encouragement to undertake the course,”Desi said. “I love being able to conduct my duties on the open road and surprising motorists when I take my helmet off. I hope that Kristy and I have inspired other women police officers to get on the bikes,” she said. Above: Constables Kristy Eyles (left) and Despina Amerikanos (right) outside the Police Academy. This page -- https://www.police.tas.gov.au/about-us/100-years-women-policing-tasmania-police/women-specialist-roles/paving-way-women-two-wheels/ -- was last published on February 13, 2018 by the Department of Police, Fire and Emergency Management.